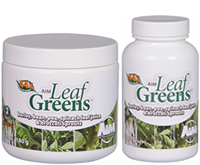 AIM Leaf Greens is an all-natural juice concentrate that combines the leaves of four young plants to create a wide spectrum of nutrients, including vitamins, minerals, antioxidants, and a balanced plant-based protein, all for whole body health. By blending the nutrient dense leaves of spinach, faba bean, field pea, broccoli sprouts, and barley, AIM Leaf Greens harnesses the potency of each component to provide superior levels of iron, chromium, protein, chlorophyll and vitamins A and K. The result is a product that supports healthy kidney function, proper bone density, oxidation of bad cholesterol, and resistance to damage caused by free radicals. Mix 1 teaspoon (3 g) with 6 to 10 ounces (180 to 300 ml) of cold water or your favorite beverage, or take 4 capsules. Take once daily on an empty stomach. New users begin with 1/2 teaspoon or 2 capsules.